Hey guys, why the change? We launched Wonder on mobile in 2016. Our iOS app was immediately featured on the iOS App Store under ‘New Apps We Love’ along with a glowing note from the editor. Now it’s 2017, and we’ve been working with SoundCloud on how best to serve indie artists and while delivering on our goal to be the best platform for music discovery. To that end SoundCloud and Wonder are now working in partnership to ensure streams generated via Wonder count towards the artist’s official Billboard chart position. 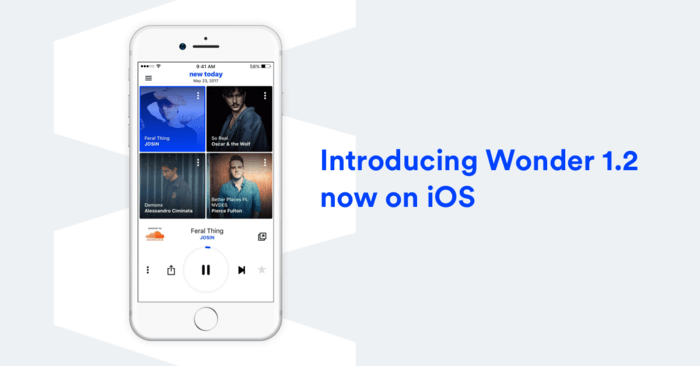 We’re also doubling down with our focus on music discovery. Tell me about those sweet new features! We noticed that you, the average Wonder user, spends about 15 minutes streaming new indie tunes each day on our mobile app. That’s enough time for about 4 new tracks. This is why we’ve updated the Wonder mobile experience to deliver you up to 4 brand-new, never-before-charted tracks every single day, that you can play once and immediately ‘star’ if you want to listen to them later via SoundCloud. But look out – if you don’t listen to them, you lose them! A little incentive to continue your Wonder habit. Starred tracks will now be saved to a new ‘Starred on Wonder’ SoundCloud playlist. We’ll still be maintaining our long-form chart playlist on SoundCloud for always-on repeat listening via the SoundCloud app. We’ve also created a new Artists Portal, so the best new indie artists and their managers have a place to collaborate on the coverage they get via Wonder and our family of social media channels, and so that artists in the daily spotlight are ensured maximum exposure. Streaming music is here to stay, and the hottest indie artists need platforms like ours to do everything they can to get you streaming their tracks. Wonder’s new partnership with SoundCloud means we can better serve you, our listeners by delivering you the freshest new music everyday. So get streaming! You can download the Wonder 1.2 app on iOS here.